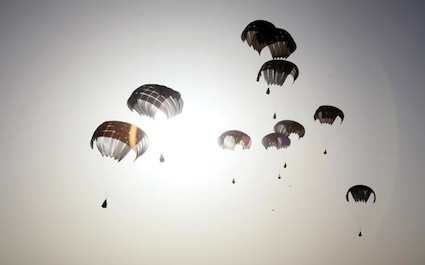 U.S. Military denies parachuting into North Korea. The U.S. military on May 29 vehemently denied a media report that special forces had parachuted into North Korea on intelligence-gathering missions and said a source had been misquoted. Current affairs magazine The Diplomat quoted Brig. Gen. Neil Tolley, commander of special forces in South Korea, as saying soldiers from the U.S. and South Korea had been dropped across the border for “special reconnaissance” missions. “Quotes have been made up and attributed to him,” he said. He denied that any U.S. or South Korean forces had parachuted into the North. “Though special reconnaissance is a core special operations force (SOF) mission, at no time have SOF forces been sent to the North to conduct special reconnaissance,” he said in a statement. Source: Agence France-Presse via Defense News. U.S. Supreme Court won’t review police Taser use cases.